Rooney in action at Wembley for the final time. 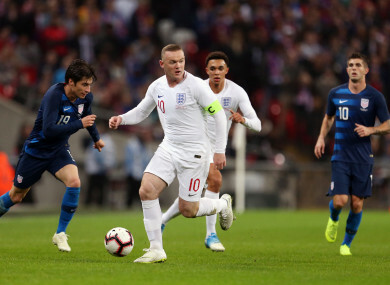 WAYNE ROONEY MADE a fond farewell to England as an experimental Three Lions side coasted to a 3-0 friendly win over the United States at Wembley on Thursday. Gareth Southgate’s decision to give all-time leading goalscorer Rooney a cameo caused some pre-match controversy with record appearance holder Peter Shilton saying caps should not be “given out like gifts”. But, after being presented with a golden plaque prior to kick-off, he received a rousing reception and, as Rooney becomes a part of England’s past, Southgate will be delighted by his glimpse into the future. Jadon Sancho, making his first England start, was a constant menace and set up Trent Alexander-Arnold for his first international goal shortly after Jesse Lingard’s sublime opener. Debutant Callum Wilson then earned a deserved goal to round off the win in the second half on a decent night all round for England – one that would only have been made sweeter had Brad Guzan not denied Rooney in stoppage time. England – noting eight changes from the team that beat Spain 3-2 in the Nations League – were nearly gifted the opener when Guzan’s woeful clearance was quickly crossed to the near post by Sancho and skewed wide by Wilson. Christian Pulisic was denied by Jordan Pickford after chasing his own throughball at the other end, but two goals in the space of 104 seconds killed the visitors’ hopes. Lingard opened the scoring in the 25th minute with a stunning bending effort from the left of the box into the top-far corner, before USA were overrun in midfield and Sancho played in Alexander-Arnold, who hit a fierce first-time strike across Guzan. The tempo of the match dropped significantly after the break and it took the 58th-minute introduction of Rooney to bring Wembley back to its feet. But the game was sewn up when Wilson was rewarded for a promising display by poking home Fabian Delph’s teasing left-wing cross. Email “Wayne Rooney makes 120th and final appearance as Three Lions ease past USA”. Feedback on “Wayne Rooney makes 120th and final appearance as Three Lions ease past USA”.